Here’s another bit of off–the–cuff anthropology. It is related to the entry here and my perception that there is less of a difference between “insider” and “outsider” in Naples than in many other places. Perhaps it relates also to the local ability—or lack thereof—to learn foreign languages. Anyone who teaches English as a foreign language abroad (as I do) comes away with the feeling that some cultures are better at it than others. A cursory stroll down almost any street or into any store in northern Europe will leave you with the impression that everyone—say, in the Netherlands—speaks English. Movies and TV are routinely in the original language and subtitled in Dutch, and local children will no doubt hear thousands of hours of English before they get a chance to study it formally in school. They are primed for French and German in much the same way. It is a polyglot culture. You communicate anyway, even without proper verb conjugations, and those little niceties of language fall by the wayside as the difference between insider and outsider gets more and more muddled. You communicate, and it is almost like being present at one of those mighty births of creole language that linguists tell us occur when cultures and languages blend. Thus—here’s the point (you knew there had to be one in here, somewhere! )—Neapolitans are as willing to accept their own mistakes in other languages as they are to accept your mistakes in theirs. Yes, there are cultures in the world that are so xenophobic that they reject any attempt on your part to speak their language, much less take out membership in that culture. If that is one end of the spectrum, there certainly must exist cultures at the other end—the place where all the “flexible, hospitable, outgoing and undemanding” xenophiles gather and get along. Looking from the town of Capri towards Montesolaro and Anacapri. My friend, Bill, keeps encouraging me to read Graham Greene because that author is so depressing, cynical, and writes so well. Thus, almost at random, I found this from Greene's This Gun for Hire. He had been made by hatred; it had constructed him into this thin smoky murderous figure in the rain, haunted and ugly. His mother had borne him when his father was in gaol, and six years later when his father was hanged for another crime, she had cut her own throat with a kitchen knife; afterwards there had been the home. He had never felt the least tenderness for anyone; he had been made in this image and he had his own odd pride in the result; he didn't want to be unmade. Is there a special reason why the person who wrote that passage—almost a caricature of Evil—chose to live in Anacapri, or why he called attention to the fact that he regarded the town not only as a place to have a house, but a home, or why he was especially proud of the honorary citizenship bestowed upon him by that community? The passage cited has at least a little to do with Greene's perception of the presence of evil in the world. It's everywhere. The world, after all, is a seedy and decaying pit with absolutely no guarantee that good will win out, for there is no assurance that good persons in the world can be counted on to do good. It may go even further than that: there may be no good persons to speak of! Or, at least, if there are, they are helpless in the face of the irresistible nature of evil. It is stronger than we are. What, however, does that have to do with Capri, and, specifically, Anacapri? Perhaps it is best to think of the Isle of Capri precisely the way it looks as you approach it from the sea—as two different places. And for those of you who don't know, those of you who have blindly accepted the arrogant cartographic hoodwink that 'Capri' is Capri, well, that's not so. 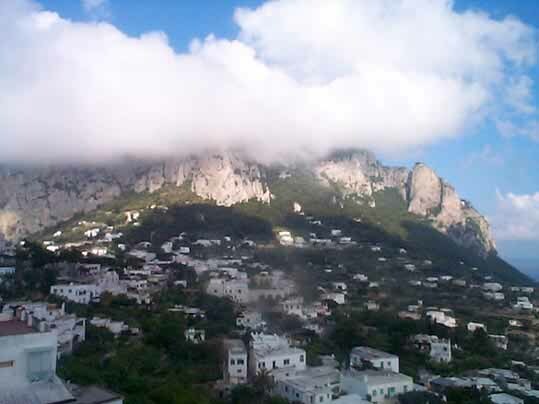 The island is, in fact, two different places: one low and one high—Capri and Anacapri. According to a good source of mine, a young woman from Anacapri, this physical configuration of the island corresponds perfectly to the differences between the residents of the two towns, Capri and Anacapri, in that the Anacapresi are morally and spiritually superior to the inhabitants of the town of Capri. After all, she claims, monks don't go down into mineshafts to meditate, they go to the tops of mountains. And since she is morally superior, she wouldn't lie about that, either. Look at the infamous piazzetta, the town square of Capri. Here you find prodigal ne'er–do–wells wallowing in cafes and bars, smoking and lounging on the steps of a church (! ), aimlessly wandering around, drinking too much and buzzing too much in that nervous stirred-up fashion of swarming insects trying desperately not to notice that the façade they are clinging to is cracking. These are, you must admit, at least potentially "smoky murderous figures" (see above). (For you democrats out there, we are not presuming guilt, here, merely presuming evil—an entirely different matter.) These are your jet-setters, the 'lovely people', people out for a 'good time' ('good', of course, not in the proper theological sense of 'morally correct' but in the perverted modern sense of 'that which produces ephemeral physical pleasure and a nice suntan'). Here is where you can well imagine a character in one of Graham Greene's novels sitting and brooding about having been 'made by hatred' or being 'haunted and ugly' and not 'feeling the least tenderness for anyone'. On the other hand, high up the hill, past the protective bulwark of the hermitage of S. Maria Cetrella perched on the cliff, and, thus, well above Man's Fallen State, iniquity gasps like a carp out of water. There lies Anacapri, where there is only one real square, to speak of, and that is in front of the Church of Santa Sofia. There is no brooding or sulking here, either. (It is illegal ever since the town fathers erected that 'No Brooding or Sulking' sign that dominates the square). It is here that we truly realize for the first time why 'Anacapri' and 'good' rhyme (at least they do in Lepcha, a minor dialect of the Sino-Tibetan family of languages, but perhaps I digress). Not only that, but the square of Santa Sofia is only a few minutes from the chair–lift to the top of Monte Solaro. If and when the Evil–alarm went off, Graham Greene was just a moment away from salvation, from transcending, moving ever upward like Dante after Beatrice, or Goethe after the royalties on Faust, for Evil, especially southern Mediterranean Evil, has been shown not to be particularly viable above 250 metres, unless there is a lot more annual rainfall than one normally finds on the slopes above Anacapri (see "smoky murderous figure in the rain", above). All in all, then, perhaps it is only in Anacapri that Graham Greene may have been somewhat less convinced of the all–pervasiveness of Evil. And that's not so bad, is it? Cimarosa was the most highly regarded Italian composer of his day (this, just in case you have been tricked by the film Amadeus into thinking that this honor belongs to a Viennese court composer by the name of Salieri). Cimarosa was born in Aversa near Naples and was admitted to the Conservatorio di S. Maria di Loreto in 1761 where he made rapid progress as a violinist, keyboard player, singer and, above all, a composer. He left the conservatory in 1771. He first gained a broader reputation by his contributions to the opera buffa, the unique Neapolitan music form that had become the rage of Europe ever since Pergolesi's La Serva Padrona decades earlier. Cimarosa's early works such as Le stravaganze del conte, Le magie di Merlina e Zoroastro, Il ritorno di Don Calandrino, Le donne rivali, and Il pittore parigino belong to the rather large body of light-hearted and neglected music from the 18th century, much of which has simply been historically overrun by works in the same vein by Mozart and Rossini, as well as by the changing tastes in music when all of art was swept into the great age of Romanticism. 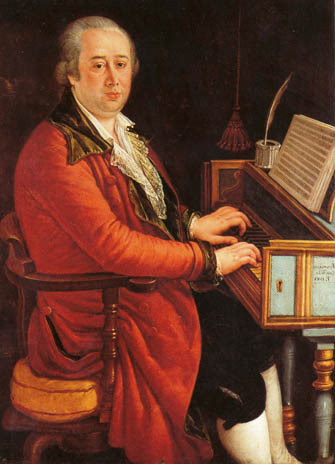 In 1785 Cimarosa was appointed second organist of the Neapolitan royal chapel and also held an appointment at the Ospedaletto conservatory in Venice. In 1787 Cimarosa accepted the position of maestro di cappella at the St. Petersburg court of Catherine II. On the way to Russia, Cimarosa made the acquaintance of the Grand Duke Leopold of Tuscany, who later, as emperor (1790-92) would be helpful to him during his stay in Vienna. He also met Caroline, the Vienna-born wife of King Ferdinand of Naples—a woman who would loom large in his own future in another few years. Cimarosa stayed in St. Petersburg until 1791. He was one of a long line of Italian composers employed by the Czarina. He returned to Vienna where he was appointed Kapellmeister by Leopold II. He wrote a number of comic operas there, most notable of which was Il matrimonio segreto, based on The Clandestine Marriage, a farce by Colman and Garrick from 1766. It was enormously successful and is, today, still one of the very few Neapolitan comic operas in the standard repertoire of opera companies in the world. It usually runs in Naples every two or three years. He returned to Naples in 1796 and became the first organist of the royal chapel. He immediately became embroiled in the politics of the day, that is, the republican fervor sweeping Europe in the wake of the French Revolution of 1789. When the Neapolitan Republic was declared in 1799 and the royal family fled from Naples to Sicily, Cimarosa lent his skills to the cause of the new Republic and composed a patriotic hymn that became the "national anthem" of the Republic. When the Republic fell and the Bourbons returned to power in Naples, Cimarosa tried to make things right by composing some music for his old acquaintance, Queen Caroline, and her husband, King Ferdinand. Both king and queen, however, were hell-bent on revenge, and Cimarosa was one of the one-thousand "Republicans" put on trail for treason. He spent four months in prison and was spared execution probably by the intervention of his friends, Cardinal Ruffo and Lady Hamilton, and by his own plea at his trial that we was merely a composer. Yes, he had composed that Republican hymn, but he had also written music in honor of the royal family. That's what composers do: you pay them, they compose music. Whatever the reason, the "hanging judges" of the Bourbon tribunal let him go with exile. Cimarosa moved to Venice where he died in 1801. Despite rumors that Queen Caroline of Naples had him poisoned, he most likely died of natural causes. Though now overshadowed, Cimarosa enjoyed vast renown during his lifetime. His 60 stage works were performed in all the major European capitals. He was praised by the likes of Goethe and Stendahl. His music was vigorous, yet elegant and delicate—of the kind that is today termed "Mozartean"—particularly the orchestral passages in, say, Il matrimonio segreto. Ironically, that work was premiered in Vienna in 1792, the same year that Mozart died there. It is, perhaps, an understandable quirk of history that relegates fine artists such as Cimarosa to obscurity in comparison to their larger-than-life contemporaries; in this case, that would be Haydn, Mozart and Beethoven. Tough competition, indeed. When Naples is viewed from a certain height, one of the most visible structures in the city is the gigantic Hospice for the Poor on via Forio. As they say, you can’t miss it. It is 300 yards long and five stories high (17th-century stories, meaning about as high as 7 or 8 modern ones). Decayed façade, windows gone, upper floors and much of the roof fallen in, it’s a shell—a dead mastodon that has simply not yet fallen over. I have passed it a thousand times and thought, “Either do something with it or knock it down”. About six months ago, they restored the façade around the main entrance to the building, so it seems they have taken the first option. I finally got into the building yesterday on a guided tour and, indeed, there is considerable clean-up going on of rubble and the accumulated junk of decades of neglect, a job that has to be done before real restoration of the building can take place. The original plan for the Hospice was to have one long façade fronting five internal courtyards, the central one of which would house a high-domed gigantic church that was to be the inner hub of the entire building; from that hub, passage ways were to radiate out to dormitories, dining halls, workshops, and gardens. It was actually envisioned as a sort of self-sufficient small village. The intentions of Charles III were never fulfilled. 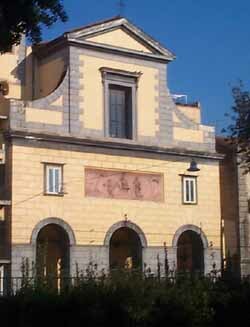 The anti-clericalism of French rule between 1806 and 1814 in Naples put an end to the central church, and two of the five courtyards were eliminated, thus giving the present configuration of one central courtyard and one on each side. Thus, by 1820 the plan to build a poor house bigger than most royal palaces had become much less ambitious. That part of the building that had been finished, however—and it was impressive— remained in use through WW2, and in its long history the Hospice has housed everything from trade schools to hospitals to the back-up archives for the city of Naples. After WW2 they even put in a football field in a courtyard to keep the local kids out of trouble. Also, there are currently some 85 families living in the building, housed in flats around the courtyard behind the east third of the façade. They are, by now, the grandchildren of the needy families that were situated there after WW2. Thus, even in its unfinished state, it has served the city. Real neglect began after WW2, and the last 50 years have been a disaster. Also, the building suffered considerable damage in the earthquake of 1980; yet, the consensus is that it is still structurally sound. In 2002 the main entrance and adjacent rooms were restored as part of a "teaching project" to help build a cadre of masons, builders and artisans trained in historical restoration. The restored section is open and houses exhibitions of one sort or another. In February 2003 plans will be approved to restore the entire building by 2006. They call for a restoration to the "unfinished" state of the early 1800s. That is, no attempt, for example, will be made to build the mammoth church that was originally planned for the main courtyard of the building. The various rooms will then be available for various functions and possibly even private enterprises that do not "offend" the history of the building. No MacDonald’s on the premises, one may assume. I was chugging down Via Caracciolo the other day on my four 14-year-old cylinders. The 18th-century Royal Gardens—now a public park—were on my left, and coming up on the right was the Castel dell'Ovo, built on the site of the original Greek settlement of Naples, later also the site of the last prison of the last emperor of Rome. I was sort of enjoying the 'history' of it all, when I noticed a gigantic tour bus in the rear-view mirror, about ready to blast by me. They were in a hurry—definitely not on a Grand Tour. 'Grand', as in The Grand Tour, means going back to the eighteenth and early nineteenth century and taking a few months off to travel around Europe and complete your education on lots of daddy's money. You traveled by ship, train (from the early 1800's onward) and horse-drawn barouche or dormeuse. You didn't wear bowling-shirt and tennis shoes, either. You packed burnouses, cloaks, frocks, spencers, waistcoats and a nice selection of cravats and collars —after all, you would be dressing for dinner, a leisurely affair with educated conversation before, during and after, enlivened, of course, by your own sparkling wit. Byron, Shelly, Goethe, Mozart, Stendahl… and on and on—they all came to Italy, and most of them came to Naples, the southernmost point on the standard Grand Tour. 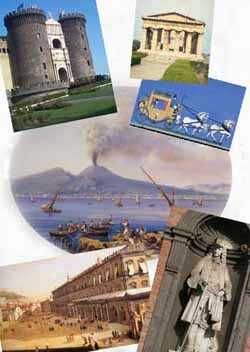 In the 18th century, visitors to Naples found a city rebuilt by Charles III of Bourbon: royal palaces, broad streets, the finest opera house in the world —a city entirely to suit the opulent tastes of the monarch and then of his Habsburg daughter-in-law who would run the kingdom (while her milksop husband 'ruled') until well into the19th century. So, as the bus went by me I frantically signaled to the tourists trapped within. I made what I was sure were universal gestures for "18th century royal gardens" and "…the last prison of the last emperor of Rome". Stop, I said, beckoning them to tarry a while and partake of genteel discourse—in short, to 'get grand'. It was too late. They were gone, on their way back to the airport. Many of the immigrants wind up in the grey world of peddling wares of one sort or the other on the streets, either on Via Toledo or Corso Umberto, two of the main drags in town. They lug their goods to and fro in those huge zippered duffel bags of the kind that scuba divers use. They generally set up right on the sidewalk: first a tarp—or maybe just large piece of cardboard—on the ground, and then they unload the leather handbags and belts, assorted trinkets, even small African musical instruments and carved animals. Some of those may even have been carved in Africa, though maybe they were done at “home” in Torre del Greco, a town near Naples right on the slopes of Vesuvius. Many of the African extracomunitari live there, sharing flats—nothing unusual in what is, anyway, the most densely populated area in Europe. I have a normal and healthy paranoia when it comes to taxis. I know that the driver is going in circles and even weirder geometries just to run up the fare on me. He recognizes me as a stranger in a strange land and is taking me to the cleaners even though that establishment is nowhere near my house. So, in an unwonted eruption of fairness, I inform you that the other day a Naples cab driver got his picture in the papers. He found a bag with twelve-thousand euros (a tad more than $12,000) in the back of his cab, did a bit of sleuthing in his passenger-log for the day and figured out who it might have been. He was right. One phone call and the lucky passenger got his money back. The consensus of opinion at the local coffee bar is that if the sum had been ten times that amount, then it could only have belonged to a plutocrat swine who would have deserved to lose the money. This is solid trickle-down economics that we tamper with only at great peril. On the other hand, twelve grand is a lot of money, but it’s not a fortune. I offered the view that “maybe it was a guy just like you or me”. The bar-owner smiled and said, “Do you walk around with that kind of money in your pocket? If so, step into the back room. I have a black-jack I would like you to meet.” The jury hung and we declared a mistrial. The seamier side of human nature—and this one restores my faith—has to do with the small local Church of San Giuseppe a Chiaia (photo) just across from the Villa Comunale, the large public gardens that extend along the seaside from Mergellina to Piazza Vittoria. One of the priests noticed that the same gentleman came in early every morning to pray. He always sat in the same pew near a small collection box, a simple affair secured with a locked, hinged top with a slot in the top where you can drop in a few coins if the spirit so moves you. The priest also noticed that the collection box—far from being coinful unto overflowing from the generosity of the previous day’s faithful—was empty most of the time. Sleuthing, again, came into play, the inductive chain proceeding thusly: (1) box full of coins; (2) man comes in; (3) man goes out; (4) box empty. Eleemosynary, Watson! An undercover cop—posing as I’m not sure what…a confessional?—caught the scoundrel extracting coins back out of the box through the slot using a wooden stick with a piece of chewing gum on the end of it. “But I was just ‘doing alms’—as our Lord and Saviour bade us,” he said. This radical approach to New Testament hermeneutics did not wash with the judge. The blackguard got 3 months. He has promised to reform—or at least change churches. Maybe he will apply for a job as a cabbie. I'm not sure. She has described a number of streets in that area. 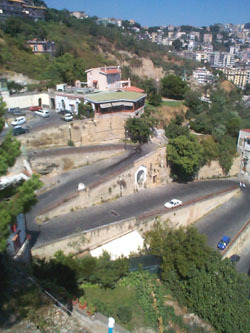 She might be talking about Rampe S. Antonio (photo), a road that makes seven 180–degrees turns to navigate down the hillside from above the Church of Piedigrotta and comes out a couple of blocks from the small Mergellina harbor. It's not a major thoroughfare, so maybe that doesn't count in the "world's crookedest street" contest. Off hand, however, I can think of a few busy roads in the city that make two or three "180s" with a few right–angle turns thrown in over the length of half a mile or so. That is what happens when a city is spread from sea level to about 600 feet, as is Naples; roads have to be either very crooked or very steep and maybe even both. For pedestrians there are also four heavily–used cable–cars in Naples. (They are also termed “funicular railways,” as in "Funiculì–Funiculà,” though that song was written about the long–gone cable–car on Vesuvius). And only brave sherpa Tenzing Norkay would feel much like singing on the way up the many stairways that web the hillside. If my friend is looking for steep streets, I think via Kagoshima takes the prize in Naples, though others come close. That's the name, too—Kagoshima. That Japanese city and Naples have paired off in one of these "sister city" affairs. Presumably, in Kagoshima there is a street named after Naples. I took a carpenter's level over to via Kagoshima the other day just to check my little car's complaint that the street has a 45–degree grade, at least in part. The tiny air bubble went way over to one side. I don't think I got an exact readout of 45 degrees, but I remember thinking that if I used that carpenter's level to make tables like that, I could sell them to people who just wanted to sit at one end and have all their food roll down to them. We don't worry too much about crooked and steep; it's "holeyness" we are concerned with. We had a sink-hole a few years ago up on the Vomero hill, above the main part of Naples, that opened and swallowed a filling section. Folklore already insists that the filling station has never been found. It has become a Texaco Flying Dutchman, doomed to sail the netherworld of Naples forever. Anyway, the father, Pippo, is also doing well and is strutting his hump around the tent. 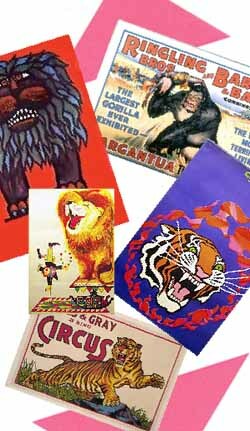 Like many, I have mixed feelings about animals in zoos and circuses. I went to the Naples zoo once many years ago and vowed never to go back. They had a beautiful Siberian tiger in a very confined space, and the animal had obviously gone “stir crazy”. I wanted somehow to release it and let it run out and go down fighting—after it polished off a band of obnoxious teenaged moron who were taunting their chimpanzee first-cousins in a nearby cage by throwing debris through the bars. 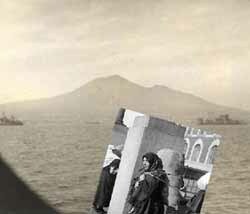 Today, generations after emigration took southern Italians over the seas, there has arisen a different kind of “emigration,” one within Italy, itself. It strikes non-Italians as strange, but Neapolitans or Sicilians who moves to Milano for a job—as so many of them have done since the Italian “economic miracle” of the 1950s and 60s, will often say that they have “emigrated,” using the exact same terminology they would if they had moved to New York or Frankfurt. After all, Milan can be just as cold, foggy and foreign as those other places—and you can barely understand the language and, Gods knows, you sure can’t eat the food up there! One difference between the overseas emigration of many years ago and the newer emigration within Italy is that many of the “new emigrants” try to make it home as often as every weekend. Depending on exactly what northern industrial money-machine they work at and where they live in the south, this can mean a four or five–hundred–mile train ride, once a week. The routine is rough: get off work on Friday afternoon, rush down to the station, catch the overnight train (nicknamed the “Fog Express), get off nine or ten hours later, catch up on sleep on Saturday, spend Saturday evening and some of Sunday with the family, pile back on the northbound train Sunday evening, get into their northern destination early Monday and rush to work without really having slept on the train. Sleeping berths and express trains generally cost more than the average worker will be able to spend every week; even the bare-bones second-class seat runs 60 euros for a return ticket. Two-hundred and fifty dollars a months is too steep for some, and the word among the “commuter emigrants” at the station is that if you jump in the last car and stand in the corridor all night, the conductor is a pretty good guy and may just not notice that you have no ticket—after all, he knows you’re just trying to get home to see your kids. I see that they put on Verdi’s The Battle of Legnano at San Carlo the other night for the first time in 142 years. He wrote it in 1849. If it was, indeed, performed in 1861 in Naples, I suspect it must have been some sort of revolutionary musical salute to the then recent defeat of the Bourbons and the incorporation of the Kingdom of Naples into the Kingdom of Italy. (I am not driven by my scholarly demons to the point of actually finding a concert program from the other night to see if I have guessed correctly.) That battle, by the way, took place in May of 1176 between the Lombard League and the forces of emperor Frederick Barbarossa. Legnano is just a short hop up the A8 autostrada from Milano (see map 19, coordinate B6 in the fabled 1995 edition of the Italian Auto Club book, On the Road with ACI.) If you get confused and wind up in Legnago, then you are way over to the east near Verona and are hopelessly lost. There is no evidence that this is what happened to Frederick Barbarossa, but he did lose the battle. And no one ever wrote an opera about Legnago—though, for the sake of completeness, I should point out that in 1879 Giosuè Carducci wrote a poem entitled Song of Legnano, in which he shows no sign of being confused at all. 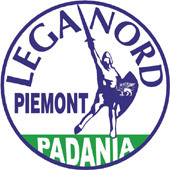 In any event, the modern Northern League (anti-Federalists who have recently pulled in their horns a bit on calling themselves “secessionists”*) call their “nation” Padania (from the Latin adjective for the Padus river, the Po, in modern Italian) and every year have a party congress in Legnano to reminisce about the good old days when central government (Imperial authority) got their cavalry kicked by the locals. Barbarossa’s grandson, Frederick II, however, soon strode upon the scene and put Imperial matters right. It used to be that when you saw someone talking to himself on the street, that was really what he was doing—talking to himself or perhaps to the Mother Ship. He was just some poor soul “from Aversa,” as they used to say around here, Aversa (north of Naples) being the site of the now defunct hospital for the criminally insane. No more. The hands-off cellular phone has arrived. 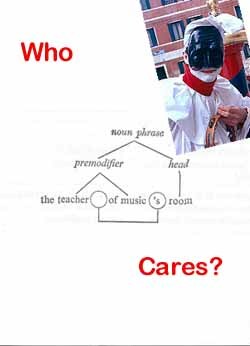 Yes, it is still possible that the man on the corner is channelling the disembodied voice of Artax, Crown Prince of Atlantis (if he has a voice with a body running around inside his head, then he is having real problems—you may wish to stand on a different corner), but, probably, he really is talking to someone. With that, the world's worst worst (sic) nightmare has come true. 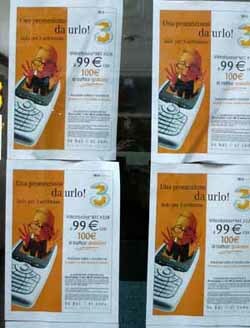 The simply 'worst' nightmare, you will recall, is teenagers plus telephones. You know, hours and hours of adolescent drivel clogging the coaxials and keeping the rest of us from getting on with our own hours and hours of adult drivel. Now, get ready for Son of Worst, to wit: teenagers plus hands–off cell phones plus motor scooters in Neapolitan traffic! Something had to happen to accommodate people like that kid on the scooter who turned in front of me yesterday. He had—illegally—two passengers on the back, was turning left at a busy three–way unmarked crossing (well, 'unmarked' except for the large sign that said: "Go for it! "), and was steering through it all with one hand only, since the other was holding a cell phone, thus permitting him at least the potential luxury of yakking his way into oblivion. He was also trying to smoke a cigarette using an auxiliary tentacle that very cool teenagers miraculously sprout for just such occasions. I have nothing against cell phones. I am very impressed by the self-importance of all those global village peacocks strutting around with their electronic status toys—into restaurants, movies, churches, shops, bars, funerals, public restrooms and concerts. Orchestra conductors just love to hear one ring during the closing pianissimo of, say, Tschaikovsky's sixth symphony, and when they go off at just the right moment, they can even heighten the fulfilment of passion (—although some experts now speculate that that might actually come more from the concussion you get when you bolt up to answer the phone and whack your skull on the tin roof of a Fiat 500). And now with the “call waiting” function, you don't even need two phones to wheel and deal; with one cell phone, you can always have "Geneva on the other line". The possibilities are endless. Anyway, for that very lucky scooterman in front of me (yes, he made it through —they always do), the main body of the hands-off voice-activated cell phone is mounted below the handlebars and is connected by a cable to earphones and microphone worn by the driver. The smiling young woman in the ad for the device is, tsk-tsk, not wearing a helmet (nor were any of the three persons on that motorscooter I missed), but the earphones can, indeed, be mounted into a regulation noggin guard. At that point, the ad assures, your incoming call will be totally audible, since it is virtually sealed off from the distractions of environmental noise. Such distractions would presumably include not only the dulcet roar of general traffic, but the sirens of those annoying ambulances trying to pass you, and the screams of your illegally mounted passengers as they bounce off your scooter and are dragged with one foot in the stirrup for a few days or until you decide to get off the damned phone. You can, we are assured, keep both hands on the handlebars while you talk. When your phone rings, your "hello" or "pronto" will activate your microphone and off you talk. The only drawback, it says in small small small print, is that in order to dial out, you really should pull over since you need to punch in the number manually, and you really wouldn't want to steer with just one hand, would you? Would you?! One moment. I have to put you on hold. I have a call from Artax coming in. Some time ago I went to a restaurant at the tiny Piazzetta Leone a Mergellina, just a block from the small Mergellina harbor. Inside, I asked for the men’s room and followed directions the way one does—right in there, around there, back through there. I wound up in a cave—a real cave. It must have extended 50 yards back from the main restaurant; it was quite high and all dug out of the hill that separates Mergellina from Fuorigrotta. The cave was nicely fitted out with the necessary wherewithal to keep a restaurant going: refrigerators, air-conditioning units, storage racks, etc. And the men’s room, of course. There were no bats—at least none that I noticed. As it turns out, the restaurant is only a few yards from the 700–meter Roman tunnel (popularly called “The Neapolitan Crypt”) connecting Naples with the area beyond that mountain, specifically, the area of Fuorigrotta, the important Roman city of Pozzuoli, and the Imperial port of Baia. It was built by Lucius Cocceius Aucto, one of the great architects in the age of Augustus Caesar. He also built the other tunnel—the “Seiano Grotto”— two miles up from Mergellina, which burrowed beneath the Posillipo hill for half a mile. He built another tunnel at Baia, itself, to join the port facilities to Lake Averno. A busy man, Cocceius. Roman tunnels, of course, no longer carry traffic, though the Fuorigrotta one was used much later than one might think. It was actually kept up and expanded by the Spanish and then the Bourbons in the 1700s. Coach traffic passed through it well into the 1800s. In 1925 and 1882-5 two modern tunnels, the “Quattro Giornate” and the “Laziale”, respectively, were built to join Mergellina with the north. They flank the “Neapolitan Crypt” on either side and are heavily used today. The older one, the "Laziale," is so called from the adjective for "Lazio," the region where Rome is, and the tunnel essentially has the same function as the old Seiano one—to get traffic out of Naples and up the coast towards Rome. Back in the main part of Naples, there is now also the Galleria della Vittoria, built in 1927–8; this tunnel joins the center of Naples to the areas of Chiaia and Mergellina by running from the main port beneath Monte Echia (or Pizzofalcone), the cliff that overlooks Santa Lucia and the Castel dell’Ovo (the “Egg Castle”). Most recently—opened about 20 years ago—are the two major tunnels in the city (each about 1 km long) that form part of the “Tangenziale”, the road that links Naples with the main Italian autostrada network. One passes directly beneath the Capodimonte hill and the other beneath Vomero. 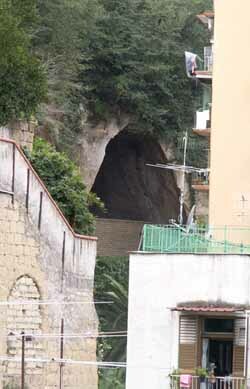 There is a third tunnel as the road moves out of the main city into the area known as the Campi Flegrei. Tunnels are just the start when you talk about “underground Naples”. Sixty percent of the city, they say, “rests on nothing”. Besides ancient tunnels, aqueducts, cisterns, and catacombs, there are more than two-hundred (!) quarried sites in Naples—man-made caves. They have been dug out of the hills of the city in the course of the centuries, going back to the Greeks, who quarried the stone to build the original city. Expansion of the city and of the city walls continued to about the time of the fall of the Roman Empire in the 5th century. Extensive rebuilding and expansion picked up eight centuries later under the Angevin rule in Naples and continued well into the 1700s. The ex-quarries may be just a few cubic meters in volume, maybe serving as someone’s garage or storage shed today, or they can be truly mammoth. For example, the Spanish dug into the hill in the Chaia section of town to build the Palazzo Cellemare in the 1560s. That man–made cavern has found various uses through the centuries and, today, has been expanded even further and converted into an underground seven-screen cinema. Even larger is the space now occupied by the Augusteo cinema. The entrance is at the bottom station of the main cable-car on via Toledo, downtown. It covers an underground area of more than two square miles, and served as an air–raid shelter in WW2, holding 15,000 persons. Speaking of cable-cars, there are four of them in Naples, each with its own tunnel to get from sea-level up to the Vomero and Posillipo sections of town at around 500 feet; some of the time they run under open sky, but most of the time they pass right beneath people’s homes. Also, the Bourbons dug out an enormous cave beneath the Palace of Capodimonte in the 1700s. Later, the same dynasty in the 1800s built a large underground passageway from the Royal Palace downtown along the port and under Monte Echia to the then new barracks at Chaia. It is said to have been for the dual purpose of moving troops into the palace area and/or moving the royal family out in case of trouble. There are two older underground railway lines beneath Naples, with one new one under construction. That makes three separate railways beneath the city with a total number of 15 underground stations plus more on the way. Some of the stations are very deep. The deepest and most difficult ones to build were the ones on the Posillipo hill. It took almost 20 years to finish them. I almost forgot: there is another underground train line coming in from the new university and the San Paolo football stadium in Fuorigrotta. That’s another major tunnel and four or five stations. I have barely scratched the surface. (You knew that one was coming.) There is also some archaeological excavation in downtown Naples. Much of the historic center of the city actually rests 40 feet above the original Greco-Roman city, which was covered by a great mudslide in the sixth century. The excavations to open the Roman market beneath San Lorenzo took 25 years. Not surprisingly, in the course of the centuries, some mythology has attached itself to the gigantic caves and tunnels of Naples. The average person in southern Italy during the so-called “Dark Ages”—centuries before the Renaissance—knew little about his Roman forebears and absolutely nothing about the ancient Greeks. Who could have hollowed out all the hillsides to produce the caves? In one example, the Roman poet Virgil was held in such high esteem in the Middle Ages that he was reputed to have conjured the “Neapolitan Crypt” into existence a thousand years earlier by his magical powers. Or—another possibility—perhaps it was the Cimmerians (as in “Cimmerian darkness”), the mythological race that Homer places near Hades in an abode of “eternal gloom”. The Greek historian, Strabo, as well as Roman writers such as Cicero and Pliny the Elder, place this race of giants near Cuma, near Naples, and tell of them carving their dwellings out of the hills in order to hide from the light. Finally, in spite of engineers’ claims that much modern construction actually reinforces the ground we live on, people around here get worried whenever it rains a lot—as it has this week. Cave–ins are not frequent, I suppose, but in the back of one’s mind , there is always that metaphor about the straw that breaks the camel’s back. Unfortunately, it was a brief dream I had yesterday morning just before I woke up. I am very upset—even saddened—by this, and I will not be consoled at all by any load of ontological dingo's kidneys that says maybe it was all real and what I am doing now is a dream. Save your breath. 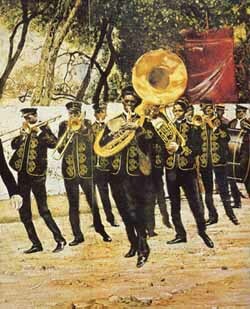 There are, however, marching bands in Naples. They are parish bands and are usually made up of not more than four or five members. They parade on the name-day of the local patron saint. They may have a trumpet, trombone, saxophone and bass drum, with someone holding the parish banner marching in front. They parade in the neighborhood around the church; usually there is someone in the ensemble whose job it is to “pass the plate” and solicit contributions for the parish. 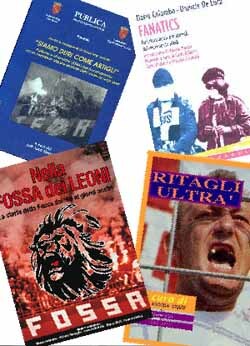 Some of the many books dealing with violence at soccer matches. The term “Hooligan” apparently derives from an English music hall song of the 1890s describing a rowdy Irish family. It may be a variant spelling of the family name, “Hoolihan” or “Houlihan”. It is not clear if Mark Twain, in The Gilded Age (published in 1873), was using it in a pejorative sense in a reference in that book to a fictitious novel he invented called The Hooligans of Hackensack. In any case, by 1898, the word was used in the British press in its current, generic meaning of “rowdy”. The word got a good work-out in the form of “hooliganism” in the Soviet Union to describe general anti-social, anti-Soviet behavior, such as loafing on street corners and making snide comments about the next 5-year plan. The word has been taken up into Italian (from the English use of “football hooligans”) as a synonym for those roughnecks who show up at soccer matches just to fight and cause trouble. It is more than a bit hypocritical of Italians to choose a foreign term; it’s as if they are saying, “We’re so well-behaved at sporting events that we haven’t even got a word to describe that kind of behavior; therefore, we cannot behave like that.” The linguistic determinism underlying that is dubious. Belay that—it’s wrong, but don’t get me started on the Sapir-Whorf Hypothesis. The violence is almost always related to the behavior of fans. They show up in masks so police cameras can’t identify them, carry tire-irons, throw bombs onto the field, and are so prone to violence in the stands that police units have to be stationed strategically to keep opposing rooting sections apart. International soccer events can be particularly egregious, as if the fans were acting on some bizarre paraphrase of Clausewitz: “Sports is the continuation of war by other means.” (“Maybe we can’t invade you anymore, but just wait till I get you out in the parking lot!”) Anyone who has ever been to a soccer match in Naples knows that the stadium is always on the verge of boiling over into violent behavior. Just a few weeks ago, a member of a visiting team was stabbed by a fan in the parking lot outside the stadium after the game. True, individual players on the field may fly off the handle sometimes—maybe push, shove, throw a punch, make obscene gestures to each other or even to the crowd, but that is generated by the heat of the moment and is uncommon. More to the point, here, is that I don’t know of an episode of collective hooliganism on the part of a team, itself, directed against the other team, the fans, or, say, the referees. Maybe it just goes without saying that adult professional players couldn’t get away with that kind of behavior on the field. The players would certainly be expelled from the game, and—if it really were a case of a whole team being involved—the team could then be banned from the league. Kids, on the other hand, can get away with it. There are in Naples, as elsewhere in the world, junior leagues for the young to hone their skills in a variety of sports. There is an active youth soccer league in Naples for 11–and 12–year–olds. The teams bear the names of local neighborhoods in the area, and the game last week was between Bagnolese and Virgilio. The game was apparently heading towards a 3-3 tie, when, in the closing minutes, the referee saw what he judged to be a penalty in the area of the goal. He blew his whistle and awarded a free kick on goal. These are a gift and almost always score. Since these leagues also serve to train the sports officials of the future, the referee of the game was, himself, only 15. When he called the penalty in favor of the home team, the members of the other team resorted to a typical 12–year–old solution: they swarmed over and beat him up! He had to be rescued by adult bystanders and taken home by his mother. One adult spectator attributed this new kind of “hooliganism” to the tendency of the media to dwell on violence in sports rather than on the game, itself. Kids watch a lot of tv. Those of us…you…who have ever reused a postage stamp or erased a cancellation so you could reuse the stamp are criminals and will no doubt be called to account some day. While you are serving hard time with your fellow felons, meditate on the humbling thought that you are a piker, a rank amateur, compared to true masters of philatelic fraud—three of whom appeared a few years ago in the Vomero section of Naples. I’ve just noticed that the three gentlemen mentioned below now have their own website, so I guess they never went to jail. For an entire year, Pierluca Sabatino, Maurizio De Fazio and Lello Padiglione drew and lettered by computer, then used on postcards and letters, more than 200 homemade commemorative stamps. None of the stamps were counterfeits in the true sense of the word. 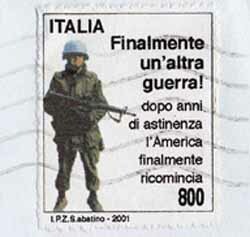 That is, they were not imitations of real Italian postage stamps. Each one of the phonies was an original and often biting satirical comment on the times. One stamp showed a young hoodlum slouching against a backdrop of the Bay of Naples; the stamp commemorated "Two Hundred Years of Organized Crime in Naples". Another issue showed a tank rolling over a sand dune beneath the inscription, "Finally a War!" And so on, from the commemorative of "The Week of Putrid and Muddy Water in Naples" to the "First Exhibition of Stolen Cars," "World Day of the Streetwalker," "Bulldozing Illegal Construction at Mergellina," and "Don't Waste Your Life on Drugs—Steal!" each stamp bore a message and an appropriate picture—and each stamp was duly cancelled by the post-office and delivered to its destination. Only once did the post-office notice; that was when the denomination of the phony stamp didn't cover the cost of postage. The addressee had to pay postage due. There was some discussion in the local media as to whether anyone in the post office ever really noticed the stamps, or whether postal employees, indulging their own sense of humor at the affair, just looked the other way. The Gang of Three even went out of their way to get caught, always including their real return addresses and even "issuing" special commemoratives that read "Check Your Stamps. This Could Be a Fake!" or "First Strike of Postal Counterfeiters." Nothing. No reaction at all. Apparently, they got discouraged at the lack of a real challenge and blew the whistle on themselves. At least that way, they would get some recognition. Now, they have a website. I guess it worked.